Kicking off with a sold out date at London’s Printworks on Saturday 23rd February, the 10-date tour will lead into Glitterbox’s 20-date Ibiza summer residency at Hï Ibiza. With a line-up of disco talent and classic house artists including Armand Van Helden, Groove Armada, Louie Vega, Purple Disco Machine, Melvo Baptiste, Mighty Mouse and many more, the DJs will be hitting the road with the usual crew of drag queens, dancers and performers that bring the Glitterbox extravaganza to life. 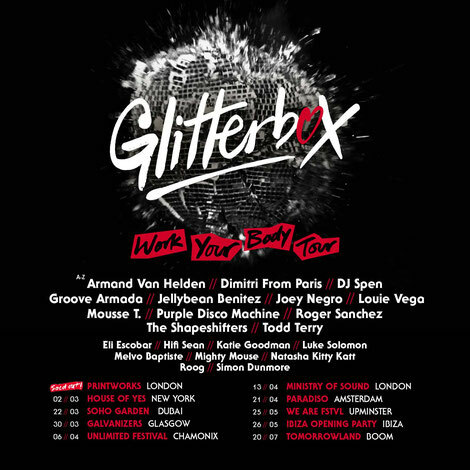 Glitterbox will focus on nurturing new and emerging artists representing the new wave of talent on the scene this year. The DJs will be joined by special live PAs to be announced across the board as they continue their live performance element.